I will admit that this is not a terribly pleasing photograph. There are unbelievably gorgeous photos from this cemetery somewhere, but NOLACemeteries.com no longer exists..The asymmetry in the iron work is due to vandalism. You can see the symbols of the “benevolent society” known as The Independent Order of Odd Fellows. They are: the mother and her children, a beehive, the Bible, the cornucopia, the world, the eye of the Deity, the five-pointed stars, the initials “I.O. 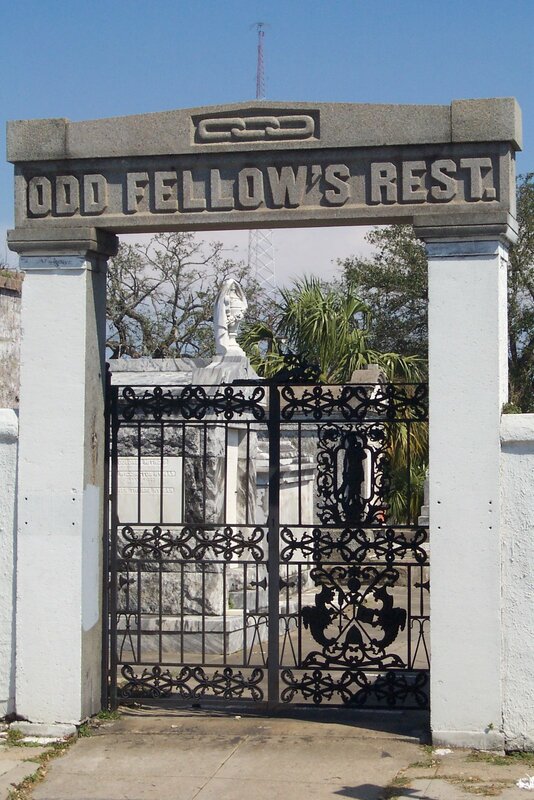 of O.F.”I’m sure you thought Odd Fellow’s Rest was just a great Crowbar album. It is that. But more importantly, in the days before trade unions or our sickeningly inefficient, corrupt welfare state, people in this country properly achieved things they might not normally afford with charities and Co-ops like the Independent Order of Odd Fellows (or Oddfellows in the U.K. where it was founded in 1730). The I.O.O.F. is a “benevolent society” wherein members pool portions of income to help other members in need while providing benefits and services to all members. This is not to be confused with organizations like the Freemasons, K of C or New Orleans’ famous Krewes. The I.O.O.F. is, however decidedly Christian and patriotic.But that system started going away once Huey Long came along in the late 20s and now “Every man is a king”. Well, we see what the entitlement mentality did for NOLAs needy after Katrina. But that is for another post. One of the services provided by the IOOF is burial after death. Not only is burial cost covered, but the relationships fostered with your community (often through charity work) and others who are reached and helped by these societies usually means that a fair number of people are affected when you die. This provides for a large turnout for your funeral. In New Orleans, they have what are called Jazz Funerals. In short, Jazz Funerals involve the presence of a musical group. A brass band or dixieland jazz ensemble are often used. They play slow, somber music as the casket is carried to its final resting place. The procession is done in a walking dance called a second line, or second lining. Once the casket is interred, the whole group turns around and dances away from the burial site with loud, happy, celebratory music. After all, we’re celebrating a life, not mourning its end, right? High standing in the IOOF or any other society will give you a large and impressive second line at your final march. If you are unfamiliar with this custom, please spend six minutes watching this amazing video. This is a real Jazz funeral, not a made-for-TV jazz funeral. It doesn’t get really fun until about 1/ 2 way in. Dig the black parasol. I’ve only seen one jazz funeral and it was nothing like this. This is a different world.This is the funeral for Kerwin James, tuba player for New Birth Brass Band. He was the younger brother of Philip Frazier, tuba player and director of Rebirth Brass Band. About 2:36 minutes in, you see The Rebirth Brass Band tuba. I don’t know if that’s Phil, but you see him assist the pallbearers for a moment.Kerwin died after a year in a coma which began when he suffered a stroke during or soon after a performance. He was 35 and living in Houston after walking out of New Orleans behind Katrina carrying his tuba.I feel a little connection with this funeral because I read Philip Frazier’s bulletins from the Rebirth Myspace page. I got to read about Kerwin’s condition, progress, down-turn and finally his passing in real-time. Here is Kerwin’s Obituary. And here is how the city & cops screwed this up (more Youtube footage included) . Seems you need a permit for jazz funerals these days in Fauberg Treme. Oh, and there may have been homicides at recent jazz funerals, some from stray bullets. Who arrests a ‘bone player? Seriously! As is customary to any mention of Rebirth by me, I must encourage you to try to see them if ever you are in New Orleans. If they are not touring, they play the Maple Leaf on Oak St. every Tuesday night. They go on at least an hour later than the posted time and make a most unbelievable noise that you must experience. For those near me in Cleveland, they get up to the Beachland Ballroom with some regularity. Lastly I will leave you with this great little video by Animator Monkmus with music by Kid Koala. It’s just lovely.